A limited numbered edition of six 17"x23" color posters printed on quality paper illustrated with over 200 color photos showing all Russian Federation awards. It also includes the newly redesigned orders from 2010. Publication date: September 15, 2011. The Russian Federation awards system can be traced back to both the pre-1917 orders of the Russian Empire and the former Soviet orders that were slightly modified and kept after the USSR’s collapse. 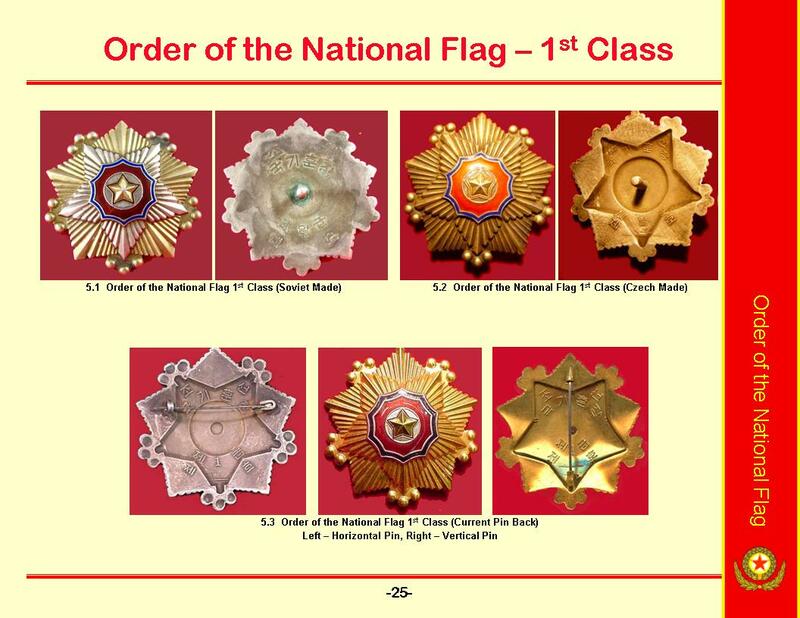 Additionally, there are many new awards that resemble Imperial awards in basic design or use the double-headed eagle. 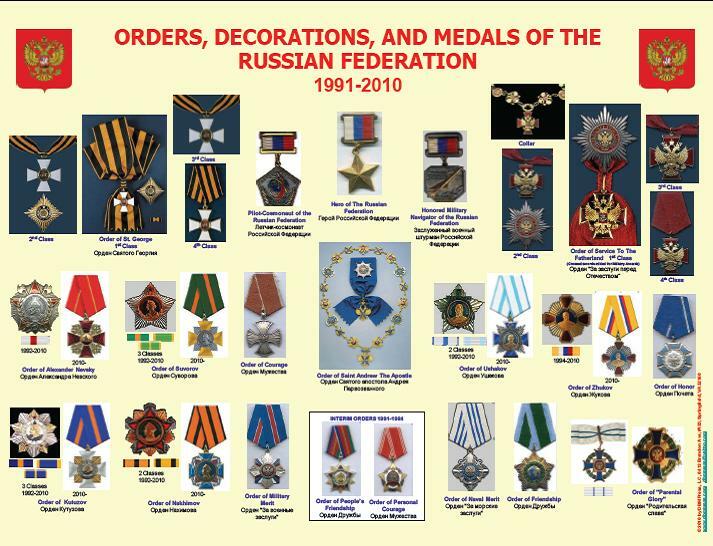 Finally, under the Russian Federation, there are also many awards that are now bestowed by ministries and departments that did not previously have their own honors system. The entire Russian Federation’s Federal Awards system was revised in 2010 by Presidential Decree No 1099 dated 7 Sep 2010. Under this decree, many of the old former Soviet orders that had been retained in 1991 were completely redesigned and went from gold and silver breast stars to enameled medals mounted on ribbons. These new awards are included on these charts. 1. Orders of the Russian Federation. 2. 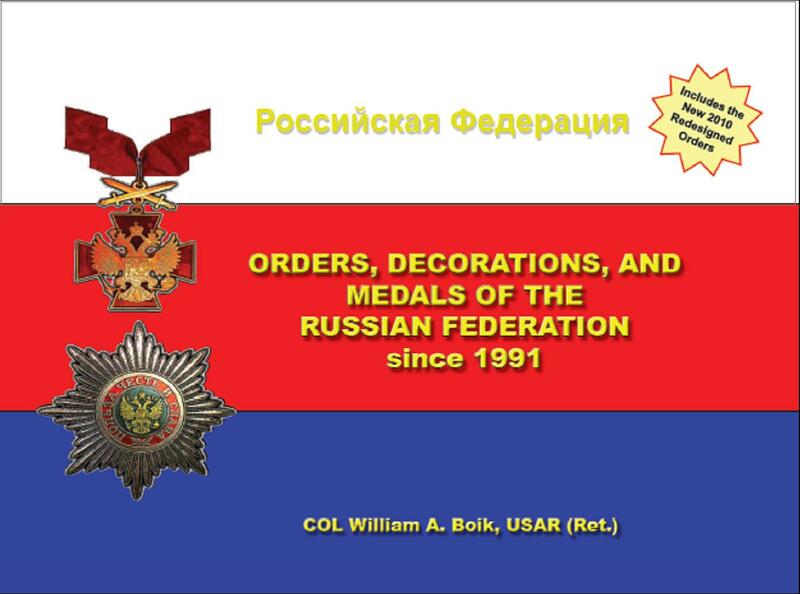 Decorations and Medals of the Russian Federation. 3. 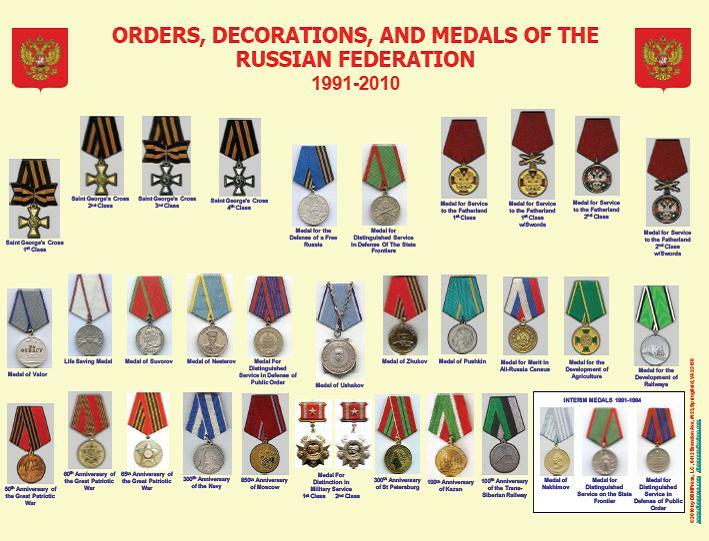 Decorations and Medals of the Russian Ministry of Defense. 4. Decorations and Medals of the Russian Intelligence and Security Services. 5. 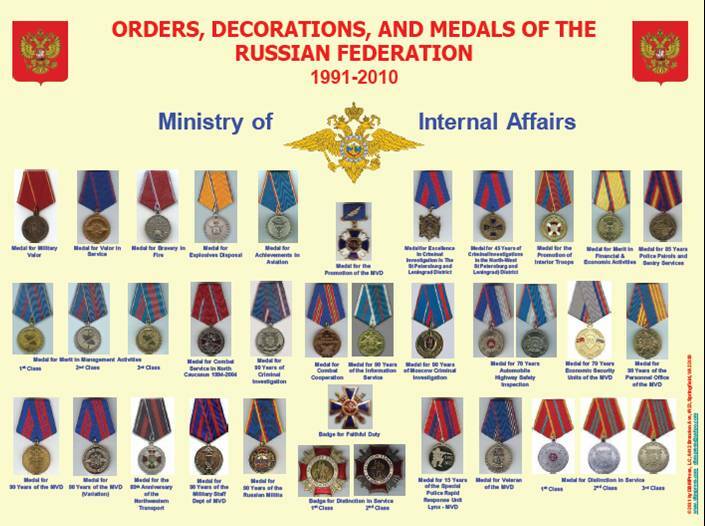 Decorations and Medals of the Russian Interior Ministry. by COL William A. Boik, USAR, Ret. Hardcover with dust jacket. 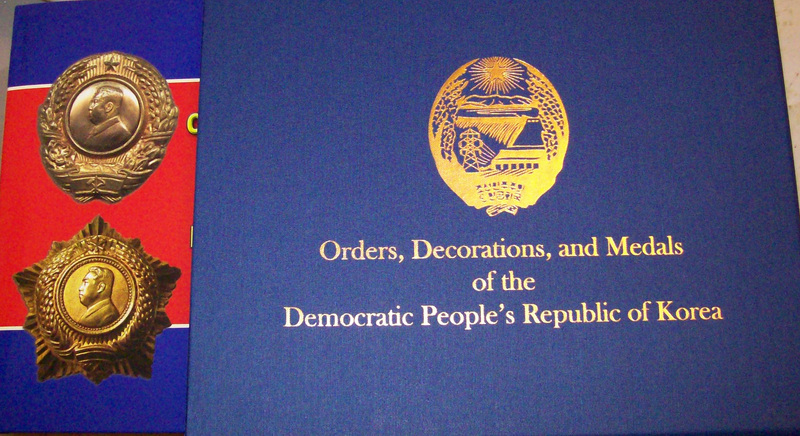 11" x 8.5", having 120 pages illustrated with over 300 color photos showing all North Korean awards. Publication date: late April 2008. This is the first detailed color study of North Korean orders, decorations, and medals. 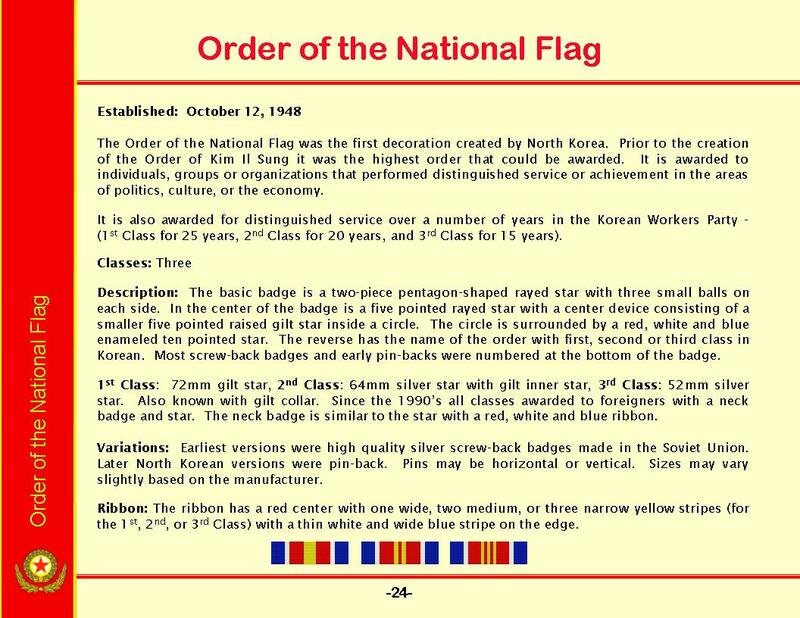 It has over 300 color pictures of North Korean orders and medals. The front and back of each award is shown in color. There are also color pictures illustrating the variations of each award, the award certificates and cases. There are four appendices in this book. The first provides the number of awards presented to both North Koreans and the Chinese Peoples Army Volunteers during the Korean War. The second lists the order of precedence for the awards. The third shows the ribbons for each award in the order of precedence. The final appendix provides a reference of the estimated value for each award. A "Must Have" reference book for collectors. First 150 copies. Individually signed and numbered. by Warren E. Sessler and Paul D. McDaniel Jr. Hardcover with dust jacket. 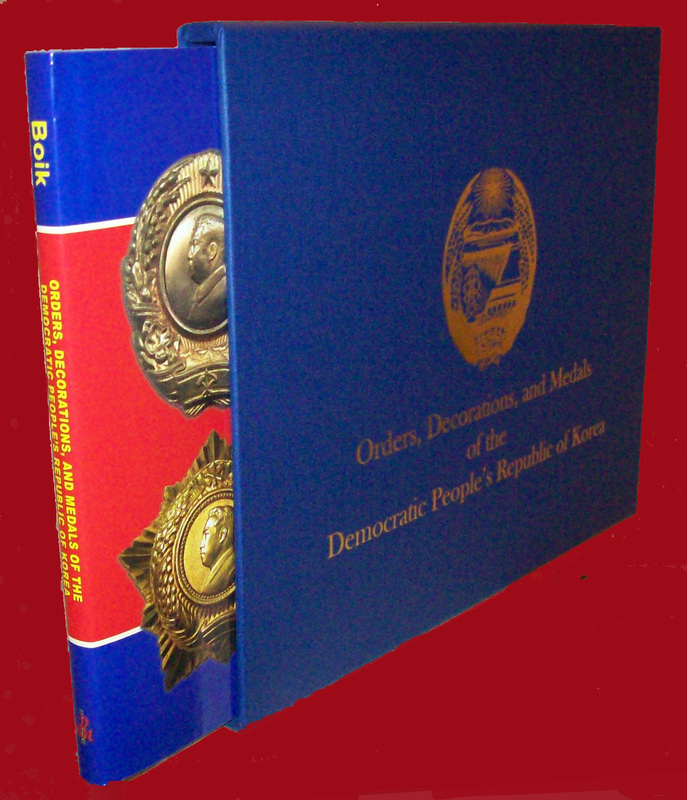 12" x 9", having 406 pages illustrated with numerous color and black & white photos showing all North Korean awards. Publisher: Sessler Inc. (Dec 2009). The newest book on North Korean awards. 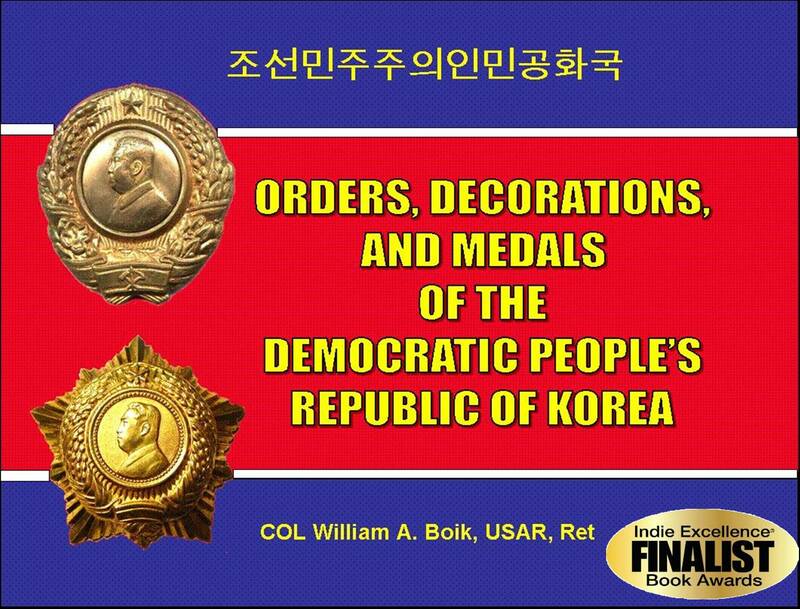 This exceptional book has over 1000 high resolution close-up color photos of the obverses and reverses of North Korean medals, orders and award documents plus some 60+ black-&-white and color photos of recipients wearing their decorations. The book contains much factual information and details including: award qualifications, all types and variations of inscriptions and mint marks, serial number styles and ranges, rivets, suspensions and pin back devices, etc. There is also a full color ribbon chart. Of utmost importance to collectors, the authors explain in great detail how to detect fakes. This book is a tremendous value and indispensable resource for any collector or student of the awards of the Democratic People's Republic of Korea. Book Dealers and Libraries Click Here for multiple copy pricing.